A dining bench can be used in combination with dining chairs or instead of dining chairs around your dining table. Since it takes up no vertical space and can be tucked under the table when not in use, its a perfect alternative to dining chairs, especially in small spaces. It is an unexpected and stylish alternative to a coffee table, offering all the same functionality and can even be an acceptable spot to put your feet up (most of the time). 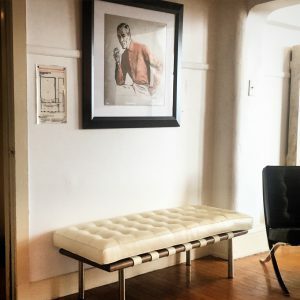 Pictured here is our Exhibition 2-Seat Bench in our Cream White Leather, serving as a landing sone to use immediately upon walking in the door. You can see this bench and all our other modern benches at any one of our factory showrooms located in Bellingham, Chicago or Dallas!